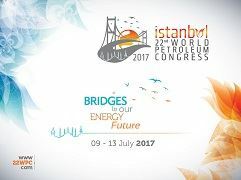 The Congress will take place from 9 – 13 July 2017 at the CNR Expo in Istanbul, Turkey. The theme of the conference is Bridges to our Energy Future and organisers are asking that abstracts be submitted now for one of the 20 technical forums for paper and poster presentations. There are four thematic blocks which include: exploration and production of oil and gas; refining, petrochemicals, transportation and marketing; natural gas processing and sustainable management issues. Abstracts can be submitted online via the official 22nd WPC Submission System. Following the review of the submitted abstracts by the Chairs and approval from the WPC committee, successful authors will be informed in January 2017.